It could be the smartest toy to come along in some time: Electronic toy maker littleBits just introduced its new Space Kit designed to give older kids hands-on experience in science and technology as they build cool space-themed projects. Developed in collaboration with NASA, each Space Kit comes with 12 electronic modules – think super high-tech Legos – that can be snapped together to create some truly advanced toys. A 30+ page booklet is included to explain how to complete 10 different toys inspired by real NASA projects, from your kids’ own remote controlled Mars Rover to a Satellite Dish that measures and displays light readings. Hundreds of other compatible activities and projects can be found on littleBits website. Individual modules snap together via magnet – no soldering, wiring, or programming is required. The kit includes the batteries and cables you’ll need to power the modules, though completing certain projects will need household craft items like cardboard boxes or popsicle sticks. 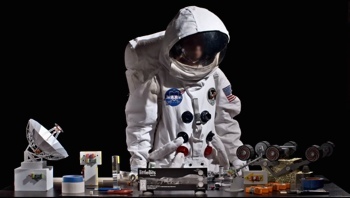 The littleBits Space Kit is a great way to give a teen with a creative instinct a way to create his or her own simple tech gadgets or bring advanced tech projects into a home schooling curriculum. Space Kit isn’t as robust and flexible as, say, an Arduino kit, but it’s definitely going to be friendlier for younger teens to use. 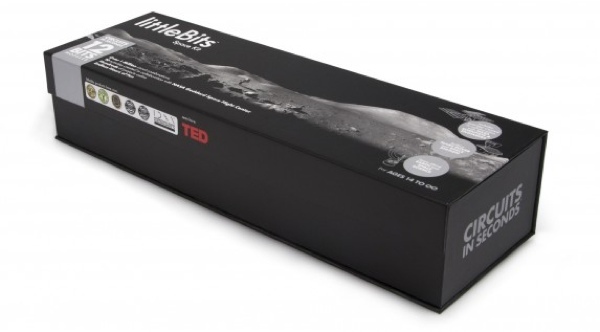 You can order the $189 littleBits Space Kit by visiting the company’s website. To learn more, check out the short promotional video below. For more smart toys for your kids, check out the programmable Ozobot robot and our 2014 Best of Toy Fair picks.